Brian Mueller has created a number of apps that have become popular due to their sadistically and sometimes intimidating nature, which aims to improve people’s behavioural traits. Don’t be put off though it’s really done in a comedic manner. The latest app to be released is CARROT Hunger, a smart calorie counter that scans your foods barcodes to log how much you’ve consumed that day and keep you within your target. Eat well and be rewarded, however binge and go over your target and expect some harsh words from the app – yes it speaks to you. If you’re feeling peckish and decided to tuck into that last slice of cake, the insults start flying in or worse CARROT Hunger may decided to publish your shame to social media by sending a notification letting all your friends know you’ve over indulged. Another form of punishment also includes a bombardment of ads, a lot of which are fake but we can imagine it’s still just as annoying. 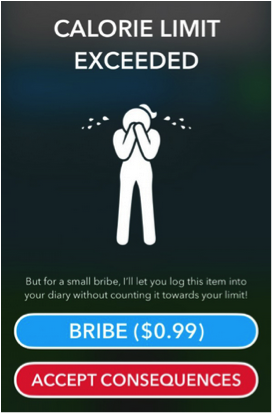 The clever way this freemium app monetises itself is through bribes – yes you can hide your secret indulgence. 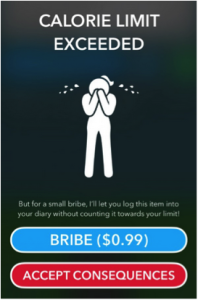 An in-app purchase means that you can keep CARROT Hunger from punishing you even when you’ve had a bad day! Creator Brian Mueller received such positive feedback from his previous CARROT Fit app – an app which had similar principals however pushed you into working out – that he was getting requests to push into the calorie counting field.